No matter how much you fight it, you're going to find yourself going out in WeHo, probably tonight, and as you're handing over $20 to a parking attendant who is definitely ripping you off, you're going to think to yourself, "Man, I'm definitely getting ripped off". Well no more, because we spent an ENTIRE WEEK parking and re-parking in WeHo, took notes on pretty much every single parking lot, and put together these printable, easy-to-read maps that point you to where the cheapest parking in West Hollywood actually is, complete with rip-off scams (signs that read "$5", but turn into $20 after 20min), great deals, and the range they charge over the course of the night. Best Deal: If you're going to Chin-Chin: free parking!... and then a looooong walk. 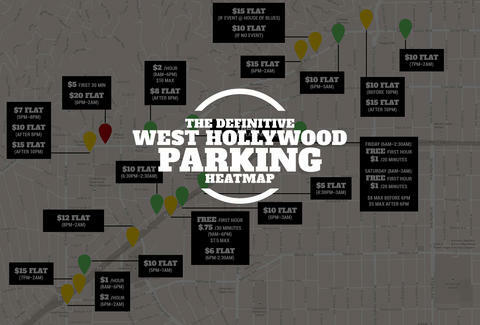 If you're Strip-raging and can get a spot: park at the lot next to the Coffee Bean -- it's smack-dab in the middle of the Sunset Strip action and is $8 flat. Worst Deal: Don't buy the "$5" sign at 8137 Sunset. They'll actually charge you $15/steal your firstborn. Best Deal: Having a quick brunch on Santa Monica Blvd? At the corner of Santa Monica and King, there's a lot that's free for the first hour. Worst Deal: If you don't make it out 'til 5pm, the lot at 9041 Santa Monica will ream you for $10. Best Deal: Because you're clearly going out on Thursday, park at that Coffee Bean lot again: after 8pm, it's $5. Worst Deal: Just down the street at Central Park, they'll try to get you for $15 if there's a show at the HOB. 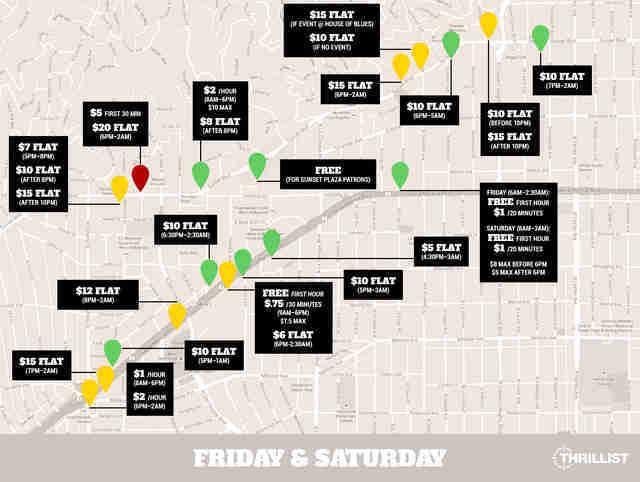 Jeff Miller is Thrillist LA's Senior City Editor, and he misses the "secret" free parking that used to be on Doheny just South of the Strip. You can ping him at @thrillistla on the tweets or @jeffmillerla on the instas. Niva Dorell Smith is a filmmaker, freelance writer, motorcycle enthusiast, and Pitbull advocate.Twitter @nivaladiva. Instagram @nivaandruby -- an account she shares with her far more popular dog.